"This is a timeline in the history of the Battle of Monmouth Monument from the early stages of its planning in 1877 until just after the turn of the century. Information is compiled from The History of Monmouth County by Franklin Ellis, published in 1885, and the Monmouth County Historical Association and Monmouth County archives)." June 28, 1877 - Former New Jersey Gov. Joel Parker, a longtime Freehold resident, delivered the commencement address for the Freehold Institute in ceremonies at the Presbyterian Church. Parker called for construction of a Monmouth Battlefield Monument and that the Monmouth Democrat editor, Maj. James S. Yard, organize the committee. June 17, 1877 - First committee meeting at the Monmouth County Court House, East Main Street, Freehold. Parker was elected president of the committee and Yard, secretary. Oct. 2, 1877 - First public meeting, also at the court house. Asher S. Parker of Red Bank was appointed treasurer, but never served, and was replaced by John B. Conover. Representatives of 15 municipalities were named as members of the Monmouth Battle Monument Association. Feb. 2, 1878 - Mrs. Mary A Schanck offered a 3.5 - acre triangular site to the association for $1, contingent on the association raising $5,000 for a statue. March 19, 1878 - New Jersey Legislature passed a law providing for the incorporation of the association. May 23, 1878 - Certificate of incorporation filed in Monmouth County Clerk's office. May, 1878 - First at-large trustees elected: Theodore W. Morris, Edwin F. Applegate, James T. Burtis, James S. Yard and John B. Conover., all of Freehold. Trustees were also elected representing 15 other municipalities. In addition to the officers elected in 1877, the following were elected: Vice Presidents, William A. Newell (Upper Freehold), Dr. Robert Laird (Wall), John S. Applegate (Shrewsbury); Executive and Finance Committee, James S. Yard, James T. Burtis, Theodore W. Morris, John H. Laird (Manalapan) and Hal Allaire. June 3, 1878 - Centennial of the Battle of Monmouth (June, 1778). Monument corner- stone placed, with inscription "Amor Patriae Omnia Vincit." Militia groups from every New Jersey town within a 50-mile radius of Freehold were represented at the ceremonies, along with contingents from Philadelphia and Delaware. Parade led by Maj. Yard, the Grand Marshall. Ex-Gov. Parker gave the keynote address, saying of the monument, "The honor of the county of Monmouth is pledged to its completion. When all here assembled shall have passed from the earth the granite shaft to rise on this spot will still point towards heaven, and in after centuries will speak to the generations who follow us of the heroic deeds and virtues of those noble men (who), on these felds 100 years ago, achieved a victory which helped to make our country free." A second parade followed, revewed by incumbent Gov. George B. McClellan. Festivities continued at a banquet held in Schinn Hall in Freehold, with as many as 900 guests seated at one time. "There was full and plenty," Eli Crozier of Delaware wrote. In all, the current governor and four ex-governors of New Jersey attended the day's events. June 28, 1879 - Donations totaling some $5,000 had been received. Deed signed and executed by Mrs. Schanck and her children presented to the association. Feb. 21, 1880 - Ex-Gov. Parker advocated application to the state of New Jersey for a $10,000 appropriation. July 10, 1880 - Donations totaling nearly $7,000 had been received. March 14, 1881 - State Sen. George C. Beekman's "An Act Relating to the Monmouth Battle Monument" passed the New Jersey Legislature. The act appropriated $10,000 for the monument and also placed the work under the direction of a Monmouth Battle Monument Commission. The association selected five trustees - Morris, Yard, Burtis, Allaire and Conover - to serve on the commission, which had representatives from both the state Senate and Assembly. April 9, 1881 - Commission organized and the state of New Jersey took over the deed for Monument Park. July 6, 1882 - The United States Congress appropriated $20.000 for the monument. Aided by U.S. Senators John R. McPherson and William J. Sewell, and supported by future president, then Indiana Sen. Benjamin Harrison, the bill had passed the Senate and the House of Representatives. President Chester A. Arthur signed the bill into law shortly thereafter. Sept. 16, 1882 - The Commission's Committee on Design (Morris, Allaire, Edward J. Anderson, General Lewis Perrine, Gen. William S. Stryker) invited submissions of designs and specifications for the monument. 1883 - Theodore Morris elected president of the commission. The son-in-law of Mary A. Schanck, a wholesale glass importer, and a democrat in the Grover Cleveland wing of his party, he served in this capacity until 1926, when he was succeeded by his son. March 2, 1883 - Design by Emelin T. Littell and Douglass Smythe, architects, and J.E. Kelly, sculptor, of New York City, was approved by the commission. National Fine Art Foundry was given the $36,000 contract for construction. May 9, 1883 - Edward E. Raht, architect, was hired to superintend construction. Nov. 13, 1884 - The completed monument was dedicated with the figure of Columbia Triumphant (modeled on actress Mary Anderson)* at the top of the shaft and five bronze tablets, depicting scenes from the battle, around the base. Height: Approximately 94 feet. The shaft was made of Concord granite, the sculpture of Quincy granite. 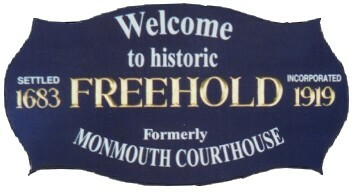 The Monmouth County Board of Chosen Freeholders decorated county buildings and constructed a 54-foot by 90-foot reviewing stand in front of the old court house on East Main Street in Freehold. Historian Ellis wrote: "The whole town was a sea of decoration, and bespoke a just feeling of pride on the part of the people that they could tread ground hallowed by associations held dear to every lover of political freedom." An estimated 15,000 to 20,000 citizens attended, some brought in by five special trains and five regular trains of the Pennsylvania Railroad and the Freehold and New York Railway. Gov. Leon Abbett, ex-Gov. Parker, U.S. Congressmen, New Jersey state Legislators, the Monmouth County Freeholders and other dignitaries sat on the capricious reviewing stand. Maj. Yard was once again the Grand Marshall. Aug. 15, 1894 - Columbia Triumphant was struck by lightning during a vicious storm, causing damage to the lower half of the statue. 1895 - A supplement to the 1881 "An Act Relating to the Monmouth Battle Monument" was enacted, appropriating $3,500 to replace the damaged statue. June 1, 1895 - Badger Brothers of West Quincy, Mass., Granite Dealers and Machinists, signed a contract with the commission to remove the damaged statue, transport it to West Quincy, sculpt an exact replica and place the latter on the monument shaft. The promised time frame for the work was six months from the contract date. The cost was $3,000. The "injured" statue was to remain the property of the Monmouth Battle Monument Commission, which was really the state of New Jersey. Spring, 1896 - Commission members went to West Quincy to inspect and approve the new statue and the new statue was placed on the shaft. June 3, 1896 - Badger Brothers wrote to the commission, asking for directions on the disposition of the original statue, which was "somewhat in our way at the present." June 10, 1898 - Agreement between Badger Brothers and commission signed. The latter was to remove the top 4 feet, 6 inches of the original "statue of Liberty," prepare it for placement "upon a pedestal or other suitable substruction," then deliver the statue to the commission by Oct. 1, 1898. The remaining lower half of the statue was to be demolished. This work would be done for the sum of $100. Nov. 9, 1878 - Hal Allaire, speaking on behalf of the commission, spoke at a freeholders' regular meeting suggesting that the statue "be set up in the court house yard on East Main Street, Freehold." The matter was referred to the Court House and Jail Committee, consisting of freeholders Brick, Stevens, Vanderveer, Holmes and Conover. Nov. 18, 1984 - A rededication of the Battle of Monmouth Monument is held at the monument site, Court Street, Freehold. A time vault with items of local interest, including a Nov. 14, 1984 issue of the News Transcript, placed in it was buried near the corner of Court Street and Monument Avenue. The vault is scheduled to be opened in 2084. *(Webmaster's note) Monmouth County historian, Randall Gabrielan, has written to inform us that "Long, exacting research proved Mary Anderson is not the model for Columbia Triumphant, although I suspect she may have been the Molly Pitcher on a bas relief."